It’s been almost two months since the UK’s Office of Fair Trading (OFT) launched its investigation and public consultation into in-app purchases in popular Children’s app-based games. As well as writing to app producers, the OFT reached out to parents and consumer groups for their feedback. A study by Ofcom, the UK communications regulator whose vast remit straddles broadcasting, telecoms as well as the Internet, showed that more than 28% of all children aged between 5 and 15 own smartphones (up 20% on the previous year), with significantly more being able to access games via their parents’ smartphones. Catering to this audience are a vast range of apps – often based on popular children’s characters such as the Smurfs, Sponge Bob Square Pants and Playmobil – which are “free” at the point of download, but in order for players to progress more quickly within the game, access new features or levels, require them to make purchases. At the heart of the OFT’s investigation is concerns over whether the pushing of in-app purchases is commercially aggressive messages that appeal directly to children. The body is also considering whether the full “costs of play” – how much you could expect to pay to make full use of the game – should be made more transparent prior to download. There had been, in the lead up to the consultation announcement, cases of parents being hit with bills of more than £2,000 for in-app purchases. When launching its consultation the OFT gave numerous examples of how in-app purchases could cost up to £70 a time; an example being in the Smurfs village game where a wagon of SmurfBerries costs £69.99. But other popular games with these high cost in-app purchases include the age 4+ rated My Little Pony, Snoopy’s Street Fair and SpongBob Moves In – based on the popular Nickelodeon SpongeBob SquarePants TV show – where virtual in-game currency can be purchased for £69.99. Although the size of the in-app purchase market is not known, it is believed around 80 of the top 100 grossing apps in Apple and Android’s app stores are free and make their money through the in-app purchase business model. Microsoft, which in planning to release its own findings on a survey carried out with 2,000 British parents, estimates that the size of the UK market for “monthly spend on unauthorised apps and in-app purchases” to be just shy of £40m. Although the OFT has made it clear it’s not looking to ban these kind of games – or more specifically the in-app purchase pioneered by social gaming companies such as Zynga with its Farmville game – unless the industries response is measured and co-operative, it is likely that the OFT will move to bring in some form of regulation – whether clearer and more transparent advertising of pricing, or perhaps daily or total caps on the amount of money that a child can spend. In turn the app-developers are likely to shift some of the focus away from their games and onto parents themselves. Although not part of the OFT investigation, the developers will argue that there are already mechanisms in place to stop devices from automatically making purchases – and that parents should take some responsibility for ensuring that these protections are turned-on, that the smartphones are not constantly logged into the app-store (meaning in-app purchases can be made with only one click) and that children should be more adequately supervised. 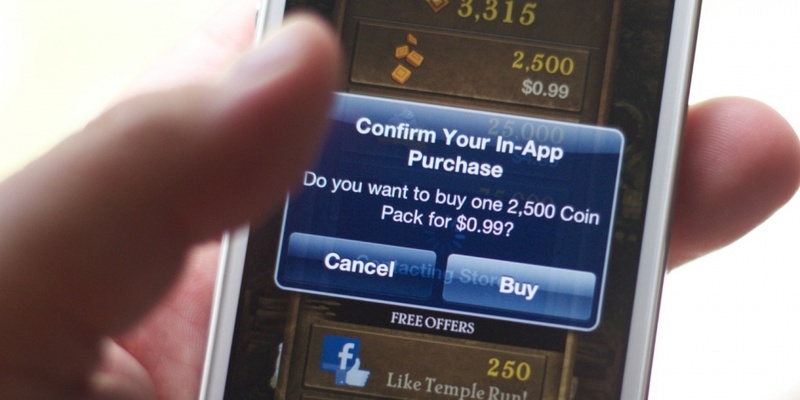 The issue of in-app purchases is not confined to the UK. In late February this year Apple settled a lawsuit brought by parents whose children had spent large amounts of money on in-app purchases. The settlement saw a US judge telling apple that it must give a $5 iTune gift-card to anyone who made a purchase of one of the “qualifying apps”, and where the children had spent over $30, to award the parents a full refund. Although the size of the lawsuit is not entirely clear, Apple have been told they need to send out notices to some 23 million users who bought these apps. The OFT’s findings on the UK in-app purchase study are due out this coming October.